Suzanne Snider is a writer, documentarian and educator whose work is deeply influenced by oral history theory and practice. Her most recent projects include sound installation, essays and archive design. 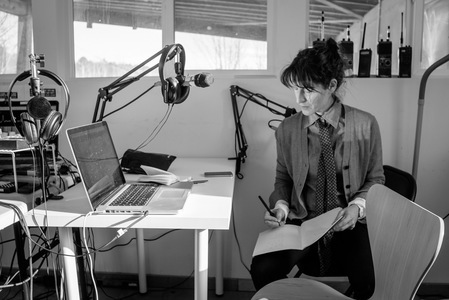 In 2012, she founded Oral History Summer School in Hudson, New York to explore experimental applications of oral history as a field/practice. Her writing/audio work can be found in The Guardian, The Believer, The Washington Post, BOMB, among other publications, and is also included in several anthologies and artist catalogues. She has received support for her projects from Yaddo, the MacDowell Colony and the Radcliffe Institute/Schlesinger Library. After receiving an MFA (nonfiction) from Columbia University (2003) as a Hertog Fellow, she pseudonymously published a book with Grove Press in 2004 (reprinted by Random House Japan 2005). Prior to her work with adult learners, she taught in the New York City public school system for five years at alternative elementary schools and developed/implemented movement arts curriculum for visually impaired students (k-12) at the New York Institute for Special Education. Currently, she teaches at the New School University and is completing a book about a divided commune in Middle America.